The single chevron stitch is a lovely textured pattern using knit and purl stitches and it creates pretty wavy lines or zigzags across your knitting. It's very similar to the ripple stitch, zigzag stitch and the afghan stitch patterns which are simply pattern variations and they're all fun to knit. This one in particular seems more dainty and pretty. If you're knitting a sweater in Stockinette you may enjoy trying this chevron pattern to add more interest. It will be lovely with those textured stitches. Chevrons can be thicker or more rounded looking. Or the 'V's are more elongated. Some knitted chevron patterns are made with pretty little eyelets for a very feminine, delicate texture. And some pattern variations are made with different colors for a really vibrant and exciting. This chevron stitch pattern is a nice simple pattern to try. They've been around for a long time and they're so fun to knit especially when you try different colors. You'll also find many pattern variations for the chevron stitch or zigzag stitch. There are so many out there and this is one teeny tiny stitch pattern. And there all lovely. 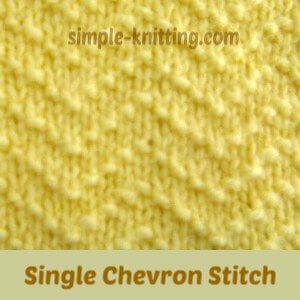 I chose this chevron stitch pattern because it's quite simple to do and it uses knit and purl stitches only. Pattern is worked on a multiple of 8 stitches. If you'd like to knit a sample cast on 16, 24 or 32 stitches. I found a lovely free chevron scarf pattern for you to try and it looks pretty easy too. It's made by Red Heart Yarns and looks pretty simple to knit. Hope you enjoy making it.